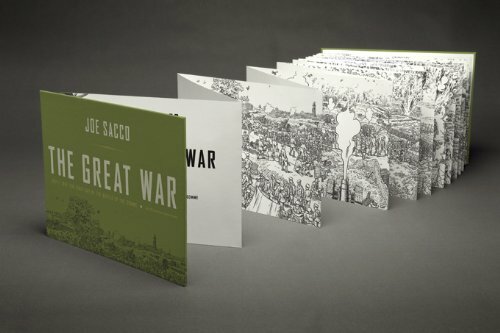 A few months ago I came across Joe Sacco's incredible book, The Great War: July 1, 1916: The First Day of the Battle of the Somme, and made a mental note to share it this Remembrance Day. The book depicts one brutal day in World War I, the Battle of the Somme, which "has come to epitomize the madness of the First World War. Almost 20,000 British soldiers were killed and another 40,000 were wounded that first day, and there were more than one million casualties by the time the offensive halted." The book is arranged in a very unique format. 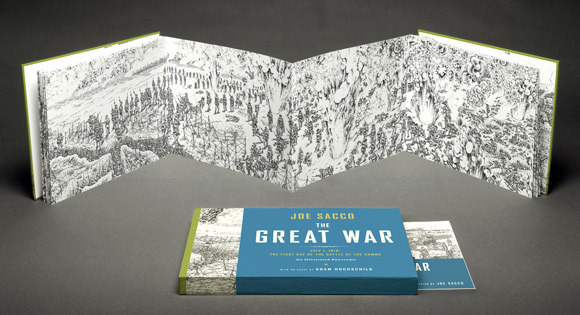 Instead of ordinary pages, the story literally unfolds from a 24 foot long page of heavyweight paper, and tells its story through a wordless black and white panoramic drawing. As we unfold each page, we are taken through the day; "everything from the soldiers on their way to the front, arriving and eating breakfast, getting prepared and heading into the trenches, to the distant bombings getting closer, to the trenches themselves, and the beginnings of the attack which sees explosions and bullets tearing apart soldiers in the most horrific ways. It builds in pitch, starting slowly to becoming more and more frenzied until the final cold silence." online review. We've all heard the horrifying stories from the front, but it's never affected me quite the way that the images in this book did. Because there were no words to guide me, I spent more time on each section of images, looking at each inch of detail and finding micro-stories within each corner of the page. The Battle of the Bulge: A Graphic History of Allied Victory in the Ardenne, 1944-45 also tells the story of one decisive battle, this time in World War II. "In Battle of the Bulge, author and artist Wayne Vansant brings readers into the frozen foxholes, haunting forests, and devastated villages of the Ardennes during that freezing cold winter. With meticulous historical accuracy and hand-drawn visuals that can tell a story in ways words alone cannot, Vansant recounts the Bulge with insightful detail, replaying the thrusts and volleys of both the combined Allied and German forces during the tumultuous battle." Publisher. Art Spiegelman's Maus is the only graphic novel to win a Pulitzer Prize. The book, written in two parts in 1986 and 1992, tells the story of Spiegelman's father, a Jewish survivor of Hitler's Europe, and describes how he himself comes to terms with his father's story. Definitely recommended for those that haven't yet experienced this classic book. Max Brooks' The Harlem Hellfighters tells the story of the first Black American regiment mustered to fight in World War I. "Despite extraordinary struggles and discrimination, the 369th Infantry Regiment became one of the most successful--and least celebrated--regiments of the war. The Harlem Hellfighters, as their enemies named them, spent longer than any other American unit in combat and displayed extraordinary valor on the battlefield. Based on true events and featuring artwork from acclaimed illustrator Caanan White, these pages deliver an action-packed and powerful story of courage, honor, and heart." Publisher.